UPDATED FEB 2019: Open for submissions – please see our updated guidelines below. 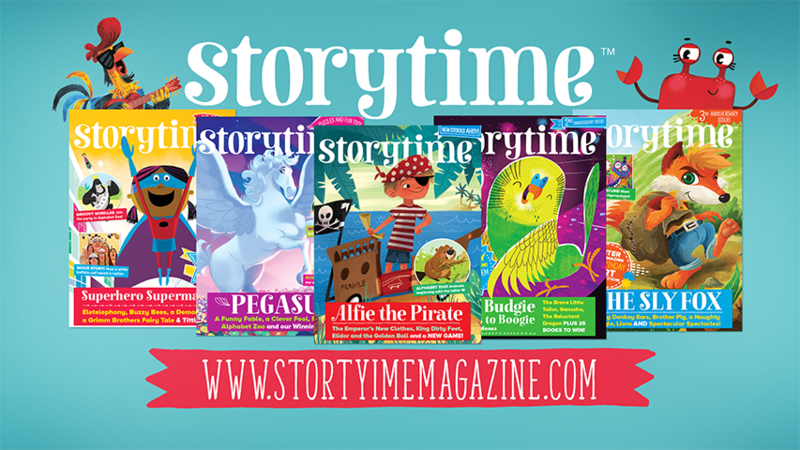 Storytime is a monthly illustrated magazine for children aged 3 to 9. It is created in the UK, but we have subscribers all over the world. Our subscribers include parents and schools, including schools who teach English as a second language. 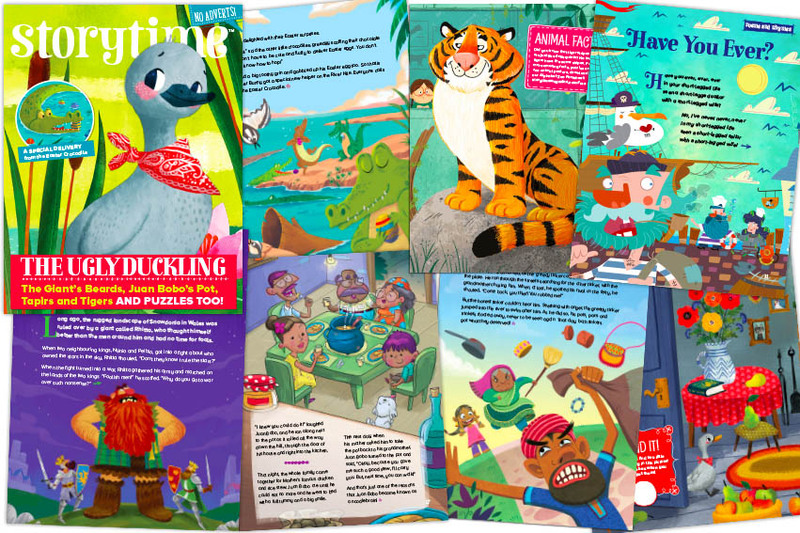 Our mission is to help all children, including reluctant or struggling readers, fall in love with reading via a selection of beautifully illustrated stories in every issue. You can read more about our passion for reading for pleasure and improving literacy here. In 2017, we launched a new section in Storytime magazine called Tales from Today, featuring one contemporary short story per issue. This is where we are looking for submissions. If you would like to see your children’s story published in Storytime, please follow our submission guidelines for writers below. Please note, we have specific requirements and, due to our overwhelming workload, we cannot consider stories that don’t follow the guidelines and we also cannot offer feedback or confirm receipt of stories. A short contemporary story (not a poem or story told in verse) appropriate for girls and boys aged 3 to 8. Your story should be between 500 and 750 words long. We are not looking for folk tales, legends, myths, fables or fairy tales – or modern retellings of these. We are looking for new stories with a contemporary style and setting. Your story should not have been published before. Your story must be in the English language, though we accept submissions from all over the world. We cannot accept submissions from writer/illustrator teams and we aren’t looking for illustrated stories. No serialised stories please – only self-contained short stories. We accept submissions by email only, ideally in Word (.doc or .docx) or other Mac-friendly word processing programs. Please do not send links to click and download files. We would like submissions to be in a standard, easy-to-read font, like Helvetica. Please not Comic Sans in a rainbow of colours – they are very difficult to read and we’ve had several of these. We do not accept stories in picture book formats (we get this a lot) – we are a short story magazine. Please do not send stories with illustrations or photos embedded in them. Email your story submission to: editor(at)storytimemagazine(dot)com. Please put the words ‘Story Submission’ in the email subject heading, and include your name and story title in the email itself. Please do not use this email address if you are an illustrator. See our Contact Us page instead. Thank you! We recommend reading Storytime before you submit. It’s the best way to know what we’re about and what we like. You can buy back issues here. Tales from Today features in Storytime magazine from Issue 29 onwards. Kids love stories that entertain, engage, excite, surprise, challenge, or teach them something new or unexpected. They like stories they can relate to and they especially love stories that make them laugh. We’d love to see stories with diverse characters. Good spelling, grammar and punctuation are important. No synopsis or cover letter is required. We’re mainly interested in the quality of your individual story. If you want to write something about yourself, please keep it brief. Lack of writing experience will not put us off. The first thing we do when we get a submission is read the story. We would like to work with writers we haven’t published before. Please do follow our guidelines if you wish your work to be considered. Read our 8 Top Tips for Short Story Writers here. … we are a very small team, so we cannot reply to submissions that aren’t successful. If you don’t hear back from us within one month, please feel free to submit to other magazines. We endeavour to be as quick as we can. Unfortunately, we cannot offer advice to individuals or acknowledge receipt of stories. However, we do offer a Short Story Critique Service here. Use of this service does not guarantee being published in Storytime. The editor has the right to request revisions and also do reasonable edits on each accepted story to make it as good as possible and will confer with you if your story is selected. We like to collaborate with our contributors. The Storytime team will select and commission the illustrations to go with each story and keep you up to date on this part of the process. We will also send you a final PDF of your illustrated story to approve. If your story is selected, you will be credited in the magazine, receive a copy of the magazine with your story in it and a fee of £150 when it is published. We will send you a commissioning form to confirm this. We hope you find our submission guidelines for writers helpful. It all sound very formal, but we’re a nice bunch! We want to create a world of joyful, passionate readers and imaginative thinkers – and we hope you do too. Watch our video below to see inside Storytime magazine.